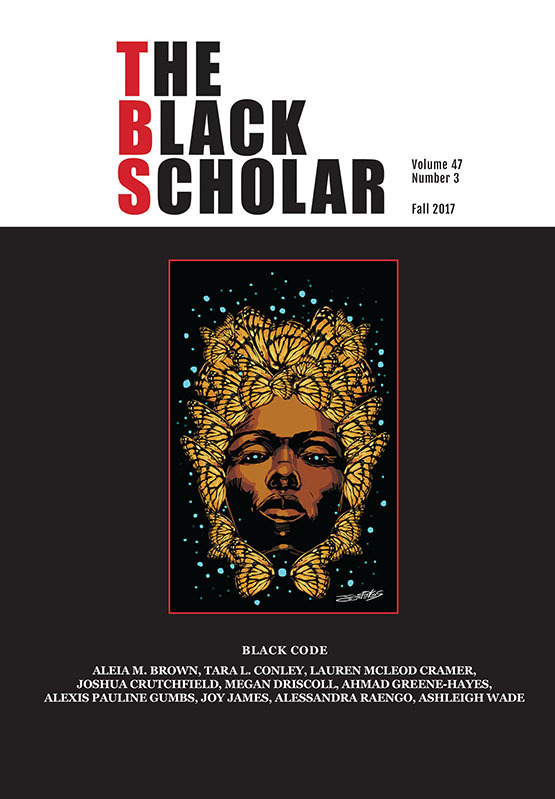 The Black Scholar is proud to announce the release of “Black Code,” by guest editors Jessica Marie Johnson and Mark Anthony Neal. Johnson and Neal have assembled a collective of digital soothsayers working on the margins of Black Studies, Afrofuturism, radical media, and the digital humanities. Black Code Studies is queer, femme, fugitive, and radical; as praxis and methodology, it waxes insurgent when the need arises. And in this moment, we are in need of Black digital insurgency, one attuned to racial scripts of the past even as it looks to future modes of Black thought and cultural production for inspiration. Barely scratching the surface, this issue welcomes new work and celebrates a Black digital fugitivity that has been present since the beginning of the internet. Our contributors include Alexis Pauline Gumbs, Lauren Cramer, Alessandra Raengo, Tara L. Conley, Ashleigh Wade, Aleia Brown, Joshua Crutchfield, Megan Driscoll, Ahmad Greene-Hayes, and Joy James, with an introduction from Jessica Marie Johnson and Mark Anthony Neal, and cover art from John Jennings celebrating Octavia Butler’s iconic novel, Wild Seed. For a limited time, download and read the introduction, “Wild Seed in the Machine,” and “Black Scholars Matter: #BlkTwitterstorians Building a Digital Community” by Aleia M. Brown & Joshua Crutchfield for free. To receive both print and digital versions of this issue, subscribe to Volume 47. When you subscribe to Volume 47, you will also receive “After Madiba: Black Studies in South Africa,” “Black Experimental Poetics,” and our final issue of 2017.